On Maui, the major beach resorts are on West and South Maui where beautiful beaches almost anywhere you look. In those resort areas, you’ll find a range of accommodations from budget hotels and condos to 5-star hotels. During the winter months of December through March, the island is blessed with a bit more rain and rainbows. 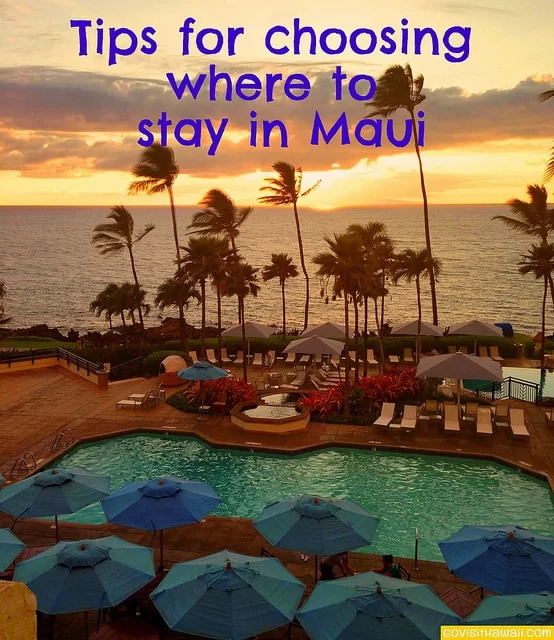 As we describe in this article, Where to Stay on Maui for the Best Weather, South Maui is a better bet for more sun-filled days. Maui’s road to Hana, that hugs the East Maui coastline, is one of Hawaii’s most scenic drives. You can drive this road beyond Hana and back from the West and South Maui resorts in a day. Ideally, this drive and its scenic diversions are best enjoyed if you can take it at a slow pace so that you can stop off at more points, take short hikes to waterfalls, etc. So, if your vacation time and budget allows, plan to stay a night or two in Hana. There is only one hotel in Hana, Traavasa Hana, but you can find vacation rentals and B&Bs in the Hana area as well. You really can’t make a bad choice of where to stay on Maui if you choose a West or South Maui accommodation. The main difference between the two is that West Maui tends to be slightly more green and tropical, while South Maui is slightly drier/sunnier. For that reason, we tend to stay in South Maui in the wetter winter months of December – March. Sometimes that’s made a difference and other times the weather was not an issue and it wouldn’t have mattered where we stayed. You just never know what kind of weather you’ll actually experience on your Maui vacation. There’s only one hotel in Hana, Travaasa Hana. See our review of Travaasa Hana which is an upscale, but rustic resort. In addition to Traavasa Hana, you can also find vacation rentals. Hana is a nice location if you want to be secluded and away from it all. There aren’t many choices for restaurants and shopping. While a stay in Hana is great for exploring the waterfalls and sights off the road to Hana, is not convenient for experiencing the rest of Maui. The vast majority of Maui accommodations are covered with South and West Maui, but you can find a few, small boutique hotels/lodges, airport hotels, vacation rentals and B&Bs scattered all over Maui. Paia and Kula both have small hotels. With the exception of Paia and Kahului, you won’t find many nearby restaurants choices at most other options. There are a few hotels in the Kahului area, which is where Maui’s main airport is located. We’ve stayed at the Courtyard Marriott Kahului Airport location due to a missed connection to Molokai. While is was clean and nicely decorated, it didn’t have the same vacation feel as the beachfront hotels in West and South Maui. Read Maui hotel reviews on TripAdvisor. Use Google Maps in the satellite mode to get a better idea of a hotel’s location and nearby beaches and conveniences. You can search by name of hotel and/or address. If you are planning family vacation, read our accommodation suggestions for a Maui family vacation. If you are planning a Maui honeymoon or romantic vacation, you might want to opt for a hotel that has adult-only pools that will offer some relaxation away from rambunctious kids. Happy New Year! I would like your advice on where to stay on Maui. We have been trying to narrow down our choices, but it has been difficult. I love the area of Hanna, but the thought of extensive driving to sight see is not on my list. Any advice on this topic would be great, thank you so much. Then I was thinking finding somewhere in the middle of the island to stay, I’m not really sure where to look. Staying in Hana for your entire Maui trip might be best saved for a return visit to Maui. Hana is beautiful and there’s so much to explore along the road to Hana and beyond, but the curvy road is not conducive to exploring other parts of the island. Consider one of the West or South Maui resort areas for most of your stay combined with a night or more in Hana. Jackie – we haven’t stayed in either of those hotels, so we don’t have any experience to share. Our advice would be to read TripAdvisor reviews for both of them. Also, explore both with satellite views on Google Maps to get a better feel for the way the resorts look and the surrounding areas. Hello! I was hoping to go diving at the Molokini crater, and was wondering if dive companies organise pick ups from west maui or if I would have to stay down south? Most Molokini snorkel, snuba and dive tours leave from Maalaea Harbor. There may be some that leave from Lahaina, but the trip from Maalaea is shorter, which usually allows for more time at the crater. I don’t know of any Molokini tour company that picks folks up from their accommodation. Just wanted to let you all know that the Alii Nui has resort pick up and drop off from West and South Maui, and they sail out of Ma’alaea Harbor.I highly recommend these folks for snorkel and/or whale watching excursions. They are the best!! We go back to them every year! Would love some advice! We just want a place with a full kitchen, clean and safe four our two little kids (age 2 and 6) and a calm beach to walk down to from our room. We can all be in a studio, but a one bedroom is ideal so if one kid wakes up the other one can keep sleeping. As cheap as manageable. We will mostly eat in. We do not need any daycare. Would love to not have to rent a car even and just stay there – snorkel one day, play in the pool the next, make leis one day. Learn how to hula dance. For about a week stay. Where would You suggest? Jen – that’s really a tall order. For a resort with activities like hula dance lessons, lei making, etc. that also has a kitchen – the prices are generally expensive. We are interesed in something similar as described but don’t need all the activities in one place… we will drive. Any suggestions? Hi there! Any thoughts on the northern area near the airport? We were looking in Kahalui. We’re interested in hitting up local eateries, farmer’s markets and just enjoying the atmosphere. At this point, the beach may actually be optional, however, I can’t imagine going to a locale such as this without spending some time at the beach. Any advice would be appreciated! Kahului and nearby Wailuku aren’t ideal Maui vacation bases in our opinion. Search TripAdvisor for hotels in Kahului and also Wailuku. Read reviews for insight. Hi there, I agree with Sheila. Definitely research the area first. If you stay in Kihei, you will still have quick access to Kahalui, the swap meet (held on Saturdays in Kahalui), and lots of different restaurants. Plus beaches are close, and you can walk S. Kihei quite easily, although it stretches quite a ways. I highly recommend Paia, as well, if you’re already up in the Kahalui area. Easy to walk around that area. Personally, we always stay in Ka’anapali, and love it there! Hi there! My husband and I spent a few days in Maui in 2012. We are going to Maui for 7 days and really want to make the most of our stay. We don’t SCUBA dive, but we do enjoy the ocean, paddle boarding, and maybe snorkeling. We really want to explore the island and everything it has to offer. We would like to spend a couple of days in one area, then move to a different location for a couple of days, and again go to a third area of Maui and stay there for a few days. We know we want to spend a couple of days in Hana. I am not sure how to determine the two other locations/general areas of the island, for us to spend time. We would like to stay in one area for a couple of days and explore everything around us….then move on to the next. Any recommendations on the two other general areas to spend a couple of nights? We would like to spend time, in the three areas of Maui, that would allow us the best opportunity to see the most of Maui in 7 days. Missy – you might want to choose between West Maui and South Maui as indicated on the above map. Getting to Hana is a long, winding, but beautiful trip. So, it makes sense to be staying overnight for one or two or more nights — you probably won’t get to see/do everything there is to do in the area, but you’ll get to see and do some amazing things. So, with the exception of Hana, you can get to most of the top scenic spots from a base either in West Maui or South Maui. Ocean conditions permitting, you can enjoy ocean activities from either area. My soon to be wife and I are planning a honeymoon to west maui and are not sure where to stay we are interested in snorkeling,skuba diving, outdoor activities any beach front properties that you can recommend? Peter – many West and South Maui hotels can provide and/or are near those activities and interests. So you have lots of options. Look for a condo in Kihei. Learn a bit more about Kihei by clicking on the link in the main body of this page listed under South Maui. Sure, you can find plenty of condos in both West and South Maui. If you want to be more off the beaten path, consider condos in the far north of West Maui, i.e. Kapalua. We stayed at Lokelani Condos. It is about 15 minutes from Lahaina Harbor. PERFECT place to stay. I just wish I could afford to stay a month.check it out online. Beautiful. 30 feet from the ocean. Hi Sheila, Your website is where I started to plan our first trip to Hawaii. Great help indeed!! We found some packages online in Aloha Hawaii website for 7 days including flights, car, resort/hotel, excursions and tours (all inclusive) packages. We can also split between them if we want to get our own flights. Is this a good deal or is it always better to make an independent package? I know that we can save a ton of money but being first time visitors … Are these packages worth it? Also, we are in between choosing from staying in Sheraton Maui, Hyatt at Kaanapali, Royal Lahaina Resort. Sheraton is coming out to be more expensive with ocean view considering all the added extra costs. Royal Lahaina Resort seems to save us a good amount of money. There is a package one for each resort in costco travel. IS it a good place to stay? Will you provide us any insights? Thanks in advance!! Hi Vinny – thanks for the kind feedback! It’s hard to say whether the all inclusive is a good deal or not. I wouldn’t know without spending an hour or more researching costs. Unfortunately, I just don’t have the spare time to do that. The upside of the all-inclusive is that you won’t have to so much planning as it’s already pre-planned for you. Personally, we like to have the more freedom in our planning and choices, but that’s just our preference. Our experience with Costco travel deals in Hawaii have been quite good. In almost every situation, Costco has been able to beat any other pricing. The only Costco deal that we’ve not liked is the helicopter ride on Air Maui. We have stayed in both the Sheraton and the Hyatt in Kaanapali. Both are very nice resorts. One thing I like better at the Sheraton is their location at Black Rock and they resort is by a very wide stretch of beach. In comparison, the beach area fronting the Hyatt is rather small. I don’t have any experience at the Royal Lahaina. I encourage you to read TripAdvisor reviews. Wow, looks like you will have a great time on your trip to Maui, whichever place you decide to stay. We stay on Ka’anapali Beach every year, and each of your options has it’s hi-lites. The Sheraton is amazing! The resort is very pretty! The location is great for the beach.If you like to snorkle, Black Rock is right there. We have seen many turtles in the water around there. Also the area has a great beach walkway leading to shopping, restaurants, and always amazing views. The Royal Lahaina Resort is on the other side of Black Rock, and has more coral in the water, closer to the beach. Another beautiful area, the location has nice grounds and very close to a golf course. Great beach walk! I don’t have experience with the Hyatt, however, I honestly don’t think you can go wrong at any of the options you chose. If you are going during whale season, I would urge you to do a whale watch tour. It is truly amazing, especially on a catamaran. Wherever it is you decide to stay, enjoy every minute of that piece of paradise! We are counting down the days to next year’s trip already! Hi there! Thanks for the great information you all have put together, it is so helpful! I am looking to stay in an Airbnb’s and found one in Wailuku at the MA’ALAEA BANYANS condos that i am interested in but wanted to get your thoughts on the area since it is neither west of south Maui. Would you recommend this area? Ma’alaea is in between West Maui and South Maui. I actually tend to think of it as being in south Maui, just north of Kihei. I am considering a first time holiday in Hawaii and quite like the sound of Maui. My wife and I are more interested a cottage style accommodation, not from a budget perspective but more for privacy and tranquility. I noticed a cottage advertised in Paia which looked and sounded interesting however I note that you make no mention of Paia in your overview of where to stay in Maui, would you care to comment. West Maui, South Maui and Hana cover the vast majority of rentals and accommodations on Maui. Paia is a small, former sugar can plantation town. We haven’t stayed there so we can’t speak from experience. Paia is a gorgeous old style town. We found it while over there, and had we known about it before we arrived, we would have chosen it as a place to stay. Hookipa beach is very close by if you like turtles. Thanks for the positive feedback, will follow up. 80th birthday celebration on Maui with 12 family members, where would you suggest to stay? Perhaps consider staying in condos or renting a vacation home? I’ve been going through your website and it is awesome! My husband and I are considering Maui as our first Hawaii Vacation. We will be travelling in end of January/beginning of Feb.
We reallyyyyy want sun and so we have been looking at the south side of Maui. Unfortunately, alot of the places you mentioned are insanely expensive once you convert CAD to USD. I am especially finding it confusing that currently the rates are approx. $500-600 USD but when I put in my dates (Jan 26-Feb 2), the rates almost double! I don’t understand as I would think they would be cheaper because it is the slower tourist time. Thanks for the kind words about Go Visit Hawaii. The Wailea area of South Maui is super luxurious and expensive. I’m not sure why rates would be almost double normal for the period you’re considering. Perhaps there’s a big convention going on? The Kihei area which is just north of Wailea offers lots of inexpensive vacation rentals. That might be a good alternative. There is no slow season on Maui. Actually February is our favorite time to go because the whales are there. We have stayed at Lokelani Condos and this time we are staying at Pailani condos. We couldn’t get into Lokelani this time. I think these two condos were comparable to what got past for a hotel and they are both within 30 feet of the ocean. Check them out! We are planning our first trip to Maui in June with our 18 year old son and travelling from Raleigh, NC. We would like to rent a condo but do not know how to decide between West and South Maui. I am so overwhelmed!! We have looked at condos through VRBO in the South Maui area. We want an area that is beautiful and has great views and is close to all activities. We are trying to keep costs down as well. Any recommendations for specific condos to check out. Don’t stress it, either West or South Maui are both excellent locations. You may end up doing a little less driving overall if you stay in South Maui, but that’s not a huge issue. Condos are a great way to go to keep costs down especially when traveling as a family. As you’ve probably discovered, there are tons of condo options. If you’re looking at South Maui, for the convenience of restaurants in Wailea you may want to look for condos in the Wailea resort area or just north of it – say around Keawakapu Beach. In West Maui, anywhere on Kaanapali Beach makes a great base. This site has been SO helpful for me while planning my Maui trip. I would like some advice: my husband and I are planning on going to Maui in October for 7 days. This will be our first time to Hawaii. We would like to stay at a resort with nice pools and activities and a nice lenai where we can eat breakfast each morning and watch the water/sunrises/sunsets from the comfort of our room. We have no children and love the thought of a swim-up bar. The biggest thing is that we want to go somewhere that feels like we are in Maui or Hawaii. So waterfront with an awesome atmosphere is key for us. I think we would prefer south Maui. What resorts do you suggest? (I read through all your reviews which were super helpful, but I would love your opinion for my specific desires). Thank you so much!!! The south Maui hotels that have swim up bars are Grand Wailea and Fairmont Kea Lani. Thank you for all the great posts on Hawaii! I’m visiting Oahu and Maui from Sept 23 to Oct 1. I will spend a few days in Maui for the sunrise and investing more days for hiking trips on Haleakala. I was wondering where is best to stay in Maui for this purpose. 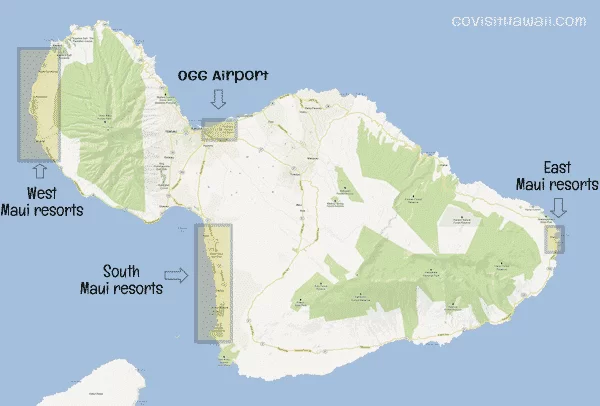 As listed, the major resort areas are West and South Maui. You could accomplish what you want from either, but it you are wanting to hike at the Haleakala summit for most of your stay, you should look for accommodations closer to there in the upcountry– like in the Kula area. There are also a limited number of rustic cabins for rent in Haleakala National Park. Hi, thank you for all your advice. We are planning on going this september with our kids (6,7) we have never been and unfortunately we will only be there for about 4 days. What islan do you think we should visit? thank you! When in doubt, we recommend Maui as it’s always a crowd pleaser.